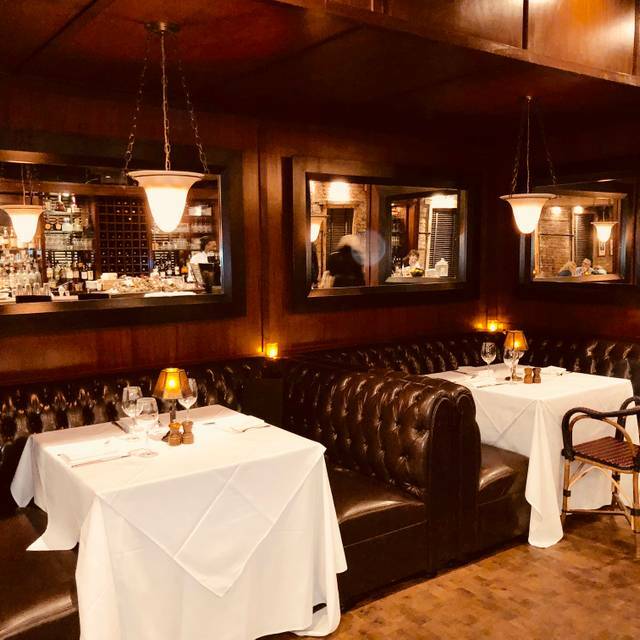 Enter SIDECAR through the private entrance on East 55th street & the staircase delivers you to a spacious yet intimate dining room of candlelit crisp white linens, reclaimed wood beamed ceiling & stone topped Osteria bar. Soft leather banquets & Bank of England chairs immediately envelope one in a unique sense of clubby comfort, enhanced by attentive personal service & the quiet calm of a unique refuge. Our food, prepared in our own kitchen is classic American; Steaks, Chops, Seafood & Raw Bar complimented by a New World wine list & traditional cocktails. The understated elegance of SIDECAR lends itself equally to Boardroom dinners, Holiday parties & Wedding celebrations. Cocktail Parties, Seated/Buffet Dinner: Up to 120. If you are interested in hosting a private event please reach out to PrivateaffairsNY@pjclarkes.com. SIDECAR is PJ Clarke's handsome semi-private upstairs dining room. The birthplace of Patrick Joseph Clarke himself, for 50 years, it was a musty antiques office. Now, its wood beamed ceiling, exposed brick walls hung with fine art, and long seemingly endless space welcomes diners to one of Manhattan's most intimate dining rooms. You enter Sidecar through a special entrance on East 55th Street. The menu, prepared in Sidecar’s own kitchen, is Steaks, Chops, Seafood and Raw Bar. Whether seated on the long banquets that run the entire length of the room, or at a table on the main floor, it immediately envelopes one in a unique sense of clubby comfort. An extensive wine collection, personal attention and the quiet calm of a unique refuge complete the experience. It was fantastic. The food and service was excellent. The service and the food were exceptional, as usual. We always have a very pleasant experience here and feel well taken care of. Sidecar was the complete opposite of the downstairs dining experience. The atmosphere was more open and airy, the dining room is a more refined, the food was amazing. Even the waitstaff were next level. This was a very enjoyable experience, and I look forward to the next opportunity to dine at Sidecar. Always love coming here. Delicious menu, great NY atmosphere, friendly pro staff. Lovely service. Delicious food and yummy desserts!! I really like the Sidecar and go as often as I can. Had business clients in town and had a great time. The service staff is helpful, friendly and made the dinner a huge success. The food is always great - opted for the burger this time and it was excellent. We went to Side Car after the St. Patrick's Day parade and had a great meal and a terrific time. Overall, this place is very good. I like how it's separate form the bar area (which can get very loud and rowdy). Every time I go it's very low key so it's great for an intimate date or business conversation. Some of the portions on the apps could be a bit large but the food is very good. When I have gone in the past, management pays close attention to every detail. The food was delicious and the service, excellent. The atmosphere of the restaurant was very good, however, I ate the burger and was very sick from it. It's a shame, because the taste of the burger was good, but the quality of the meat was not very good or very fresh. The atmosphere was nice, the manager and hostess were so nice and accommodating. our party changed from 4 to 6 at the last minute and they were so nice about it. However, the menu was not all all what was represented on the website. The service was very slow. The drinks came out slow and cost the restaurant some money because we were sitting there with empty glasses for some periods of time. ALso, the food came out slowly and was delivered to the wrong people (which by itself, is not a big deal, but with everything else was annoying). Most of our party did not like the waitress. She was quiet and didn't really show much personality or enthusiasm for her job. Limited menu, over-priced even for NYC, dinner for 4 with one appetizer and 2 glasses of wine was $280! All sides alacarte nothing comes with entree. Food was average...not worth a $300 tab! "I love the relaxed feel of this place – like a comfortable dining room in a friends home. I definitely would return to try more dishes. We went due to good reviews. The food was bland and service was slow. The bathroom is also in middle of where people dine and not out of the way. I would not recommend. Loved it! My only disappointment was that I viewed the menu on line and saw scallops but when I saw the actual menu when we got to the restaurant that night, there were no scallops. I asked the waiter and he checked with the kitchen for me but alas, no scallops. Other than that, I loved it. I ordered the fish and chips and enjoyed them very much. this was a 'ladies' dinner during the early evening (5:00 pm) and it was incredibly enjoyable to have arrived before the dining room filled up. The service was top notch and specials were communicated although we did order from the menu. The salmon was delicious and portioned well and the chicken dish was also delicious. My wife and I took her sister to out on a visit from Europe. Started with a couple of cocktails at the bar, a couple of sampler west coast oysters on the house and settled in for a great night of casual, tasty American cuisine and fine wine. Great ambiance, history and I bet the walls could tell stories. Liked the casual relaxed vibe and great service at the bar! I've always found their service to be top notch, which has been hard to come by in other restaurants of same price point in the city. For that, I will always come back. Our dinner party of 3 had the wagyu burger and fish and chips plus the s'mores sundae for dessert, along with great wine (as always). The portions are generous, and the food quality was good. As for the infamous burger, I got tired of the rather bland flavors after the first half. Beware that this is a really big burger. Great job overall. 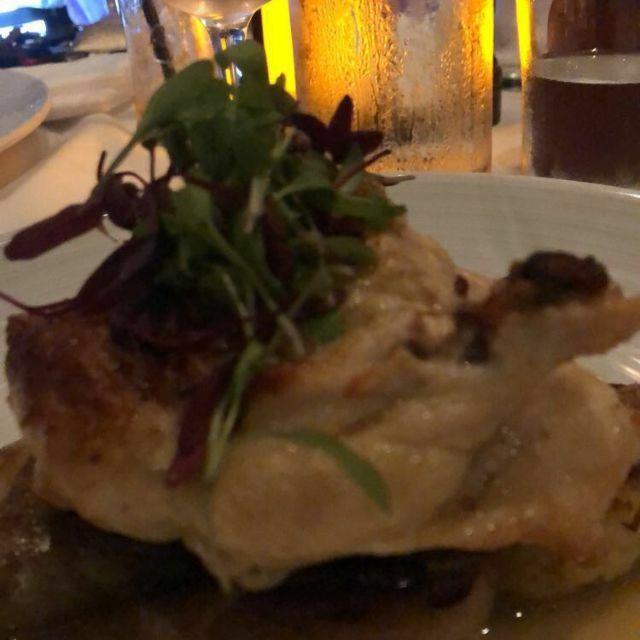 Love the food , the service was great. Great food and service. A neighborhood standout! Excellent ambience, food and service. Good place for a business or social lunch. Really enjoyed our meal tonight ! Will definitely be back! The food was fantastic ! We enjoyed a casual business dinner. The food and service were excellent. The accoustics are perfect for conducting business and uninterrupted conversations. Will definitely return! Service was outstanding - from how we were greeted to our final bite! Very relaxing and the entire staff was friendly and helpful. Go with the short rib! Our hostess and our servers were outstanding as was the food. This is a go-to for members of my firm for business lunches. I love to go for a nice meal with co-workers. We have been patrons on the original PJ Clarke's since I was a teenager, which was almost 40 years ago! We have had been celebrations there and taken many friends and family members to experience the authentic ambiance, great food and incredible service. This Saturday night we finally wanted to try Sidecar as a long awaited date night. The weather was pretty cold, so there were a good amount of tables available. We were seated in a fabulous booth, that was comfy and large and yet intimate. The ambiance at Sidecar is fabulous. We ordered Mac & Cheese and Fried Calamari to share as appetizers. Outstanding! For dinner we ordered a burger and fish. Again, outstanding. Dessert was apple pie a la mode, which we shared. Our problem was the service. OMG! Atrocious. For everything that was wonderful, this killed our experience. Our waitress started out ok. Nothing special, but nothing awful. A little too casual, but whatever, it is NYC after all. We never got an answer as to what happened, but she was late with our drinks. As in 30 minutes after we ordered and already got our appetizers. The entrees came out very long after. No plates were cleared until we asked. My husband inquired about a specific brand of whisky (which we had downstairs) and she said "we don't have that". My husband then went to the bartender to find out they do have it. We had to educate our waitress what was on the drink menu. WTF?! The pièce de ré·sis·tance was dessert. We ordered apple pie a la mode and it took over 30 minutes to arrive! During this time our waitress was no where to be found. We had to hail over the hostess and inquire why the dessert was taking so long. The reason we were given was "it comes from downstairs". Yeah, so what. At that point I was happy to go get it myself. We may give Sidecar another try in the hopes that the waitress will either be fired or learn how to do her job. But more likely, we will stick to the regular dining room and go elsewhere for fine dining. Steak was way too well done even though we ordered it medium rare. The server did not bring us any bread. She told us afterwards we needed to ask for it. There were 6 ladies for lunch on a strangely quiet day - a combination of weather and Xmas week. Everything went surprisingly well since we’re not an easy bunch. I love Sidecar!! food was good, but some dishes much better than others. service was spotty - did not mention specials, not very attentive, etc. Service was a bit slow that night and apologized for the delay. The noise level was not excessive and allowed for conversation at the table; hard to find nowadays. Delicious meal . Best short ribs I have ever had. The sauce and potatoes were memorable. My friend had the salmon which was cooked perfectly and delicious . The apple dessert was very big and delicious with ice cream and whipped cream . The service is very good. The room is spacious and you can hear the person you are dining with . Would not have expected this as associated with Pj Clark’s but highly recommend Sidecar and it is now on my top 10 list . Old New York atmosphere with delicious menu options. From the exposed brick walls and wood beams to the black and white pictures on the walls, P.J. Clarke's takes you back to old New York. The service was impeccable. We enjoyed oysters, shrimp cocktail and the incredible pigs in a pretzel blanket to start. This was followed by some great salads and burgers. The sidecar is very festively decorated with white Christmas lights. Don't miss this special spot for a terrific dining experience! We went to celebrate the Christmas holiday. The service was excellent and the food delicious. Decorated beautifully for the holidays. Sidecar is as if you went to your Dad's Country Club, but with food that is truly exceptional. Cozy and intimate, with brick walls and a center bar, you can feel the history in the room. But there is nothing old and stuffy about the food! Fresh oysters, delicious apps and entrees that are on match with any of New York's great steakhouses. On its way to becoming a New York Institution.